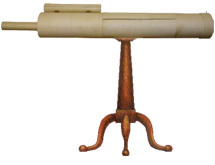 This life sized pop-up sculpture, in the shape of a telescope, satirises the relationship between two forms of government; a Republic and a Monarchy. 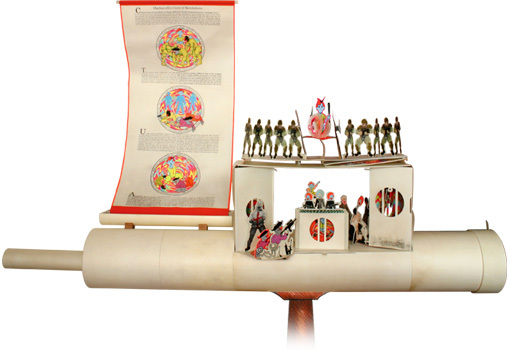 In drawing together references from Machiavelli (his characterisation of the 'cycle of revolution': the rise and fall of all forms of government), the French Revolution (the ascendancy of the Third Estate and the subsequent Terror), and the appropriation of American cartoons and corporate logos, the project aimed to critique the shift in political power from state to corporation in the latter part of the 20thc. Painted with ink and egg tempera.